Curse of the Chupacabra is the follow-up to Hebler’s debut novel, Night of the Chupacabra, and picks up shortly after the devastating events in Dillmore Valley. This time around Hebler focuses on the journey of Suzanne and Jessie, two of the few survivors of that fateful night. In Night of the Chupacabra, Suzanne makes a promise to take Jessie and brothers Danny and Norman to San Francisco in order to start a new life and attempt to put the horrific memories of the chupacabra behind them. However, Suzanne is seized with doubt and thinks that she is unfit to raise the three children by herself due to her past as a prostitute and thief. Danny and Norman have already been sent to live with a new family in New York, and now Suzanne and Jessie are on their way to meet a family in Virginia City. Suzanne is also traumatized by nightmares as a result of her previous encounter with the infamous chupacabra. Jessie is handed over to the Hutchinson’s, but any sense of normalcy is quickly shattered as the chupacabra appears in Virginia City and attacks Jessie’s new family. Meanwhile, Suzanne is introduced to a man named James Carter, an actor in the company Evelyn Diamond and the Rowdy Players. James has a mysterious past, and Suzanne must quickly decide whether she can trust this man after some terrifying incidents early in the novel. Jessie is able to escape the Hutchinson’s with her life and reunite with Suzanne, who then head off to San Francisco with the Rowdy Players, eager to put as much distance between themselves and the beast as possible. The trip west is filled with dangers as the group faces illness and the chupacabra manages to track them down, resulting in a startling conclusion. While I really enjoyed continuing the mystery of the mystery of the mythical cryptid in Curse of the Chupacabra, its first half didn’t quite capture my attention as quickly as the Night of the Chupacabra did. The first half leans more toward the traditional Western genre and focuses mainly on Suzanne and Jessie with only brief mentions of the chupacabra. There are still elements of danger that play out through these early chapters, but it seemed to lack the same energy of the first novel. This also could be because the passengers on the train – the first setting in the book – don’t have the same strong personalities as the residents of Dillmore Valley. That being said, the second half of the novel where the chupacabra returns in full force is excellent and also re-introduces some familiar faces from the first book in the series. I also want to take a moment and say that Jessie continues to be far and away my favorite character of the series thus far. She is a fiery character who displays toughness and ingenuity and has the most personality of any of the characters in my opinion. Despite being only 12-years old, I feel like she is the one most equipped to deal with the dangers posed by the chupacabra and life on the run. She is totally self-reliant and gets her and Suzanne out of plenty of jams based on her pickpocketing skills. Curse of the Chupacabra is another entertaining installment in Hebler’s series on the monster and ends with an interesting twist that promises more exciting novels ahead. If you have not already read any of Hebler’s books, I recommend checking out the series and giving it a try starting with Night of the Chupacabra. If you have an interest in the Western/horror genre and cryptids, this is a series worth checking out. 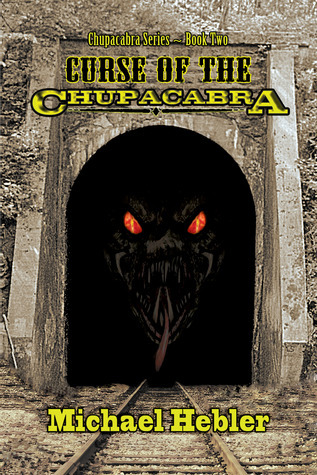 The third book, Legend of the Chupacabra, was recently released at the end of July.